Ontario has placed first 19 of the last 21 years. In other years, they were second 5 times and third 3 times (1991-1993). Quebec has been team champion 8 times, including the first 6 years. They also won in 1997 and 2009. They came in second place 17 times. They were third in 2000 and fourth in 2011. British Columbia has come in second place 5 times (1991-1993, 2000, 2011) and third 17 times, including 2014 and 2015. Alberta has placed fourth 17 times and fifth 5 times (1994-96, 2005-06). They finished in third place in 2003, 2004, 2005, and 2011! New Brunswick came fifth 7 times (1992, 1998-2000, 2013-2015) and sixth 14 times. In 1989 they finished in third place! Manitoba was third in 2002 and 2006, fourth in 2003 and 2005, and fifth in 1990-91, 2001, 2004, and 2007-12. Saskatchewan was sixth in 1998 and 2011, and seventh in 1997, 2000, 2004, 2015. Newfoundland has placed fourth 3 times (1994-1996) and fifth 3 times. Nova Scotia came in sixth place in 2005, 2007, and 2008. They were seventh 7 times. Prince Edward Island had its finest moment in 1993 when they came in seventh place. 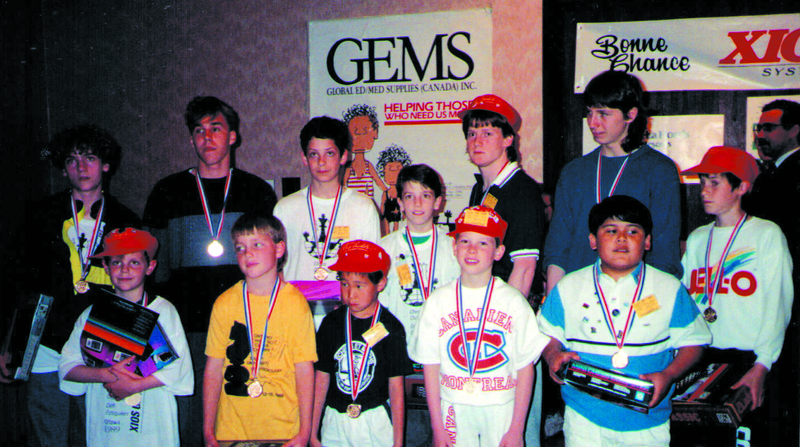 Canadian champions of the first edition in 1989. Lefond Hua (1st Grade, QC), Victor Chernoff (2nd Grade, QC), Laurent Gascon (3rd Grade, QC), Anthony Castillo (4th Grade, QC), Daniel Williams (5th Grade, ON), Nicolas Soudre (6th Grade, QC), Alexandre Marcil (7th Grade, QC), Martin Glass (8th Grade, QC), Adam Littke (9th Grade, ON), Leonard Morrissey (10th Grade, NL), Nicolas Arsenault (11th Grade, QC), Jonathan MacDonald (12th Grade, NB).